Does your profession demand that you spend a lot of time on your feet? Or do you engage in rigorous physical activities that exert a lot of pressure on your feet? If this is you, then having regular foot massages may just be the most effective way to relieve your tired feet and possibly help your entire body relax. For this article, therefore, I’ll share with you the benefits of using foot rollers which are regarded as part of the massage family. Besides, I’ll point out several key factors to consider when buying the best foot roller for your needs. At the end, I’ll list the top five foot rollers from which you can choose. A good foot roller can be quite handy in enhancing circulation in your lower extremities. This is especially helpful for people with sedentary lifestyles and whose feet hardly get any exercise. Using a foot roller to massage your feet can help to alleviate joint pains as well as aid in foot recovery after an injury. As such, this tool helps to release chronic tension that might have piled up in your foot muscles, tendons, or ligaments. Besides, when combined with exercises, foot massages can also significantly minimise cases of foot injuries. Feet have a high concentration of acu-sensors that transmit to every part of your body. When feet are massaged using a foot roller, therefore, the positive effects of reflexology can be felt in various parts of your body including the part of the brain that deals with stress and anxiety. As earlier mentioned, foot rollers belong to the larger massage family. So, what are some of the advantages that these tools have over others in this family? Usually, foot rollers are quite small in size and weigh less compared to most other tools used for massage today. This makes them more convenient to carry around. Most foot rollers come with great designs and shapes which make them easy to use for massaging various parts of the body. Besides, most come with user manuals that contain clear use instructions. Compared to most other massaging devices, foot rollers are more cost-friendly and also cheaper to operate and maintain. There are various types of materials used in making foot rollers, and therefore you’ll need to determine which among them is best suited for you. Some of the commonly used materials include rubber, foam, and wood. Some foot rollers are more suited for people seeking to treat certain conditions such as plantar fascial problems, tight calves, or knee pain. Their suitability to aid in treating these conditions is largely dependent on their design. Foot rollers are available for a wide range of prices starting from as low as £5 up to about £20 per unit. Having walked you through the various aspects of foot rollers, I’ll now describe some of the best options you may want to consider when shopping for a suitable foot roller. Arguably one of the most affordable foot roller on the market today, the Carnation Footcare Pediroller is an excellent fit for people suffering from plantar fasciitis. As such, it comes with a well-thought-out ridged design that’s highly efficient in improving circulation. Besides, you are provided with a resourceful leaflet that outlines six podiatrist-recommended feet exercises. For greater relief, you can freeze it to enjoy more firmness depending on your needs. On the downside, however, this roller may not be suitable for people with very large feet since it’s comparatively smaller in size than most alternatives in the market. Having sore feet? Consider acquiring the Natural Wood Ribbed Foot Roller. The roller is made using natural, sustainable wood and thus shouldn’t worry the eco-sensitive users. Besides, it features rubber rollers on both ends to minimise friction and ensure smoother rides. It’s also wide enough to accommodate most of the standard feet. 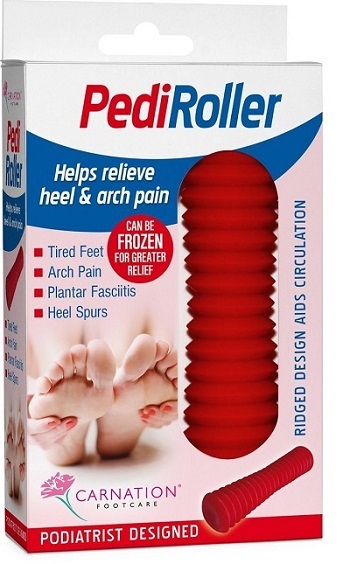 This foot roller can be very helpful in enhancing circulation. The Trigger Point Performance Nano Foot Roller is one of the more popular foot rollers today. It features an innovative ultra-compact design that helps to relieve foot aches and pains quite fast. Besides, it comes with a dense three-dimensional foam surface that’s suitable for enhancing circulation. With this roller, you will enjoy great massages that closely mirror those offered by massage therapist’s fingertips. The Lockeroom Footeez Foot Roller is a professionally designed tool that’s meant to assist people with lower limb muscular problems manage them at home. As such, the foot roller is best suited for anyone with plantar fascial problems, tight calves, or chronic knee pains. Some of the best features you will love about roller include its concave surface and ribbed beads that help to increase the area of skin contact. Besides, the unit comes packaged together with a highly resourceful chart that outlines symptoms of common muscular problems and various alternative treatments. While the unit may be a little expensive, it’s definitely worth its price. The ResultSport® Therapy Massage Roller is a highly effective tool for stimulating trigger points and enhancing circulation in the feet and other types of muscles. As such, this roller can be used to relieve pains in the hamstrings, Achilles, feet, arms, and the back. Besides, it’s suitable for use by anyone including the elderly and the injured individuals. The ResultSport® Therapy Massage Roller comes with a plastic surface which is easy to clean and does not harbour moisture or bacteria. It is also highly durable and won’t lose shape even after repetitive long-term use. Acquiring a great foot roller can be one of the wisest decision you can make especially if you often get sore or tired legs after long days. Fortunately, I have tried to explain everything you need to know about these amazing tools as well as listed some of the best foot rollers to consider. It’s now upon you to decide which amongst them best fits your needs. All of these really look like they could give a good massage. These would be something good to take on my travels in order to keep my feet loose. I have mortons nuroma can you reccomend best foot massager for this.